Data in this category begins with the DVD itself (commercial recordings) – or transfer to DVD support directly from analog or digital TV transmissions – or from our own video capture and editing process using the support as DVD video or purely as data storage media . So what to do with those DVD’s ? 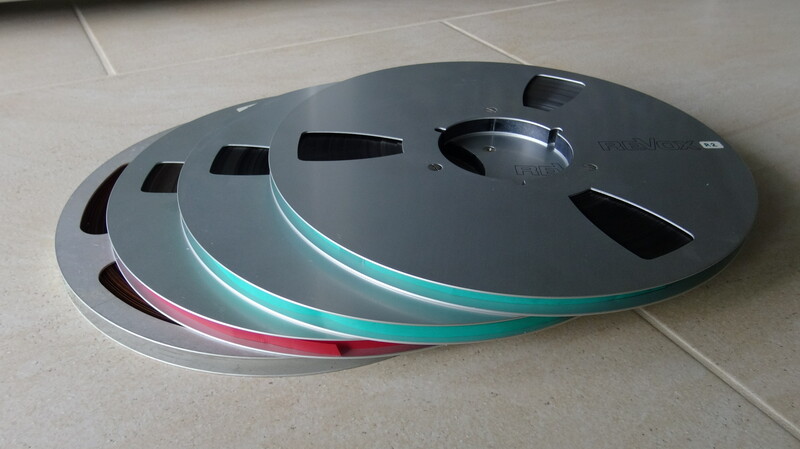 In the earlier phases of our digital archiving project, we moved from pure analog storage and manipulation (as in audio tapes) to transfer of analog video (as in the case of Hi-8) to DVD video format (hence digital) storage as early as possible to reduce risk of tape deterioration or even non-readability. In this phase we start with digital information on the DVD support, but are completely conscious of its limitations and, especially in the case of consumer/commercial DVD writers, vulnerability of the recorded data. Yet, the humble DVD is having a long life – and at the height of DVD-video popularity, we considered its SD quality limitation as acceptable. And then when used as a data storage medium for HD video files, we were quite happy to have 4.7GB per disc for very little cost ! (Note: we have never used BlueRay discs – that is a technology we have passed over, even if we do have a player/recorder and a few commercial discs). As this part of the project moves forward, we examine what is worth doing, and what technically and legally can be done. In terms of storage, 4.7GB per disc, times 100 discs, means roughly 500 Giga Byte (half a Terra Byte) which means those 100 DVD’s can be stored on a single hard disc or solid state memory and be instantly accessible (as for audio “CD’s”). listening pleasure while the computer does the work ! greens & blues done – half way there ! 80% completed – getting serious! Including back-up for a lot of data. And coffee ! So a major motivation of this segment — archiving DVD’s — is about indexing and accessibility, – getting away from the linear nature and relatively slow search and transfer of the DVD video process – while simultaneously creating a back-up. Time and patience seem more of an issue than storage cost – only if we facilitate access and increase interest value of this library (e.g. by adding or linking other information) will the effort be justified. And of course access includes eventual on-line functionality as well. Fortunately, during the period when we assembled our DVD library, we built a Jazz Musician Disc Catalog based on names of performers, instruments they play, and dates of events. Each entry is linked to a physically numbered and color-coded disc; so physical, living room access is already quite fast ! Such a substantial data file forms a good base for any archive project – although our catalog is far from complete at the deeper levels within the playlist – for example facts about the performers and information about, and surrounding, the events. (Note: Catalog is password protected, if you are interested please request access). 1. Our first pass of digitizing content is to copy the raw DVD data to a unique file for each DVD (VIDEO_TS) and to use a computer-based DVD player for reproduction. 2. We add an image of the original DVD (see images above) and any other documentation about the recording to the same file. However, even though access to the disc and disc titles is improved, (and we now have a back-up) the level of accessibility to individual songs or sections of the recording remains at the same level as for the original disc. We will need to pass the (VOB) files of each disc through a content editing process and to re-export (as .mp4 video for example) in order to go beyond the limitations of both the DVD player functionality and to segment better according to content. This is where the time and patience challenge really hits ! 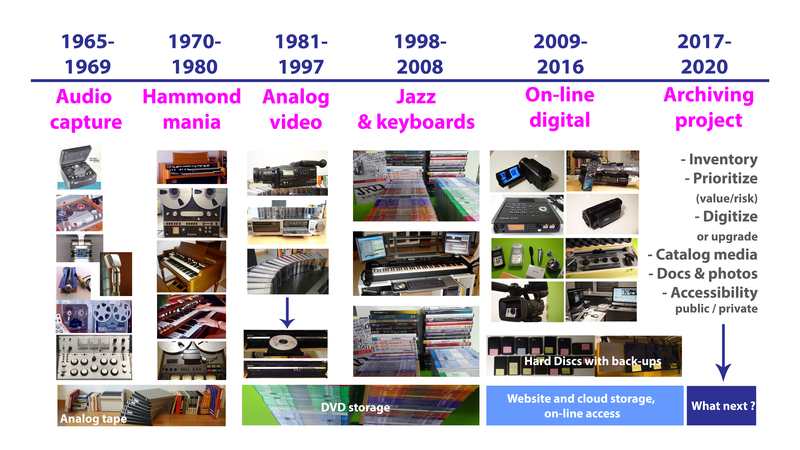 This entry was posted in 2016, Digital archiving and tagged mmm digital project. Bookmark the permalink. Theater sound control booth (house sound and stage sound effects). 1960’s Revox 736, 8-channel mixer built by those two guys, vacuum tube amplifier connected to front-of-house loudspeakers. Photo appeared in local newspaper. Note the hand-made microphone transformer assembly !